The last time I used MapQuest in was March 2005 and I remember thinking “nothing could be more cool when traveling than using Mapquest” one month later I completely abandoned the program if favor of Google Maps and since that time millions of people have followed suit as Google Maps has continued to dominate PC and Mobile map searches with such features as voice-guided directions and street views. In an attempt to gain back some of their fans and show that their product is still relevant AOL, Inc. has announced “Vibe” an iPhone app which for Mapquest which provides location based search results for restaurants, bars, services and travel destinations. Available on iTunes today, the app brings to handheld devices and tablets the same MapQuest Vibe desktop experience, including proprietary, real-time local rankings for 50,000 neighborhoods, 27,000 cities and 50,000 hotspots across the country. “Finding where to go can be a frustrating experience, especially when the majority of nearby restaurants get 3.8 stars on competitive sites and reading through hundreds of reviews takes too much time,” said Vijay Bangaru, vice president of product, MapQuest. The company says its program uses 15 years of user intent to rank locations while adding social voting to create a more accurate ranking algorithm that conducts ranking in real-time. 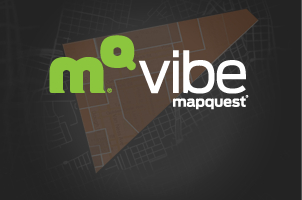 Voting: MapQuest Vibe’s voting system allows individuals to vote up or down a local business. Unlike traditional ratings sites, these votes combine with underlying walkability, popularity, going out nature, edginess, and burby-ness scores, to ultimately create the comprehensive Vibe Score. Voting also influences the location of local hotspots, causing new ones to appear and existing ones to change shape or disappear. Sharing: The game framework harnesses social and local influence, as well as overall engagement, allowing the individual’s experience to be easily shared with friends and the community via Facebook. As a fan of Yelp I have never run into a 3.8 average rating for all restaurants and other locations in my area and I personally find Foursquare Radar to be the best option for my personal needs when it comes to discovering areas of interest on a location based service. Have you tried the Mapquest “Vibe” iPhone App? Let us know what you think.